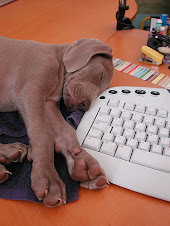 My Weekly Indicators post is up at XE.com. The forces of darkness are gathering, but they have not overthrown the day. The other day the Joint Center for Housing Studies, a privately funded think tank affiliated with Harvard, made something of a splash with a study showing that rents are increasingly unaffordable. Since the study only went through 2014, and I've been covering "median asking rent" quarterly as the information is updated, I'm going to wait for the 3rd quarter data to be released next month before commenting. 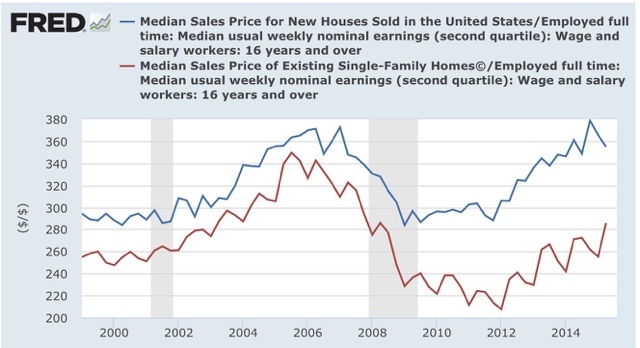 But one important point about housing affordability has gone completely unnoticed: the narrow basis for price increases in single family homes. 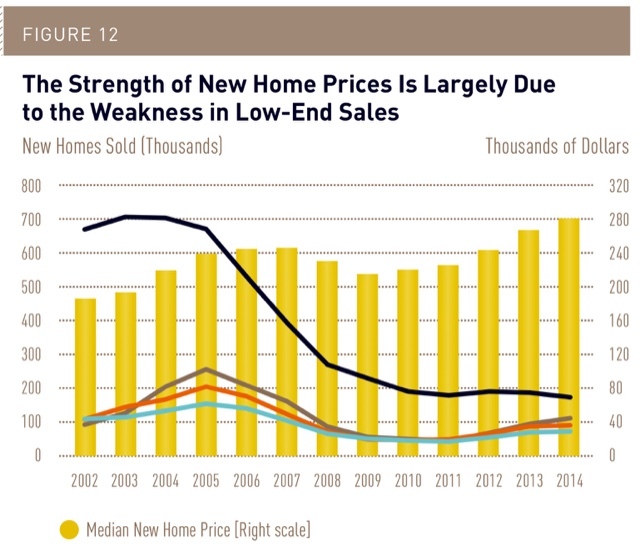 Put a slightly different way, it is primarily higher-end housing that is driving new single family home prices. I'll come back to the information in this chart shortly. 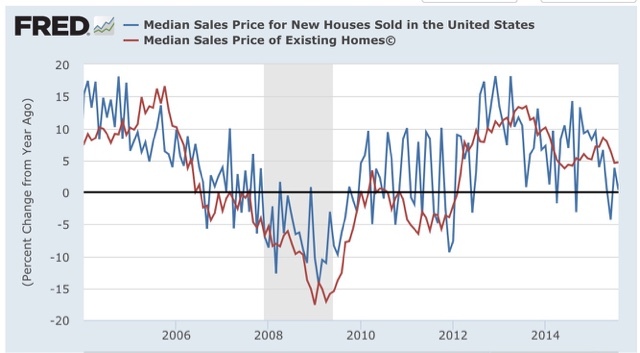 Averaged over the last 4 months, YoY prices for new houses have turned negative, while that of existing homes has paused. 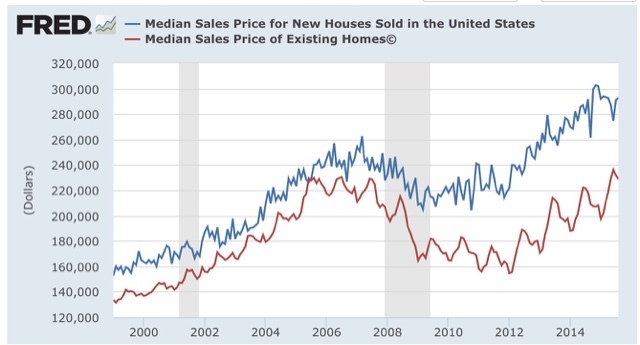 Real, compensation adjusted prices for existing homes are nowhere near where they were at the peak of the housing bubble, while those of new homes have returned and briefly exceeded that level. Now let's turn back to the information in the chart from the Joint Housing Center study. 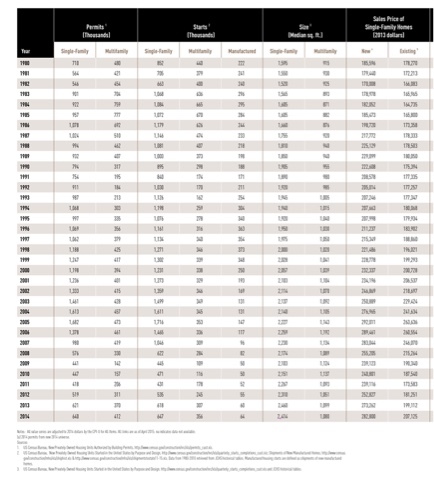 The median price and median square footage information allows us to calculate the price of housing per square foot. Prices rose by 16.1% per square foot in the 5 years leading up to the peak of the housing bubble. By contrast, in the last 5 years they have only risen 3%. Prices per square foot now are 12% lower than they were at the peak of the bubble. In summary, the latest study by the Joint Housing Center tells us that new houses are currently being built primarily for the affluent. And in real terms, those prices are not anywhere close to their bubble peak. 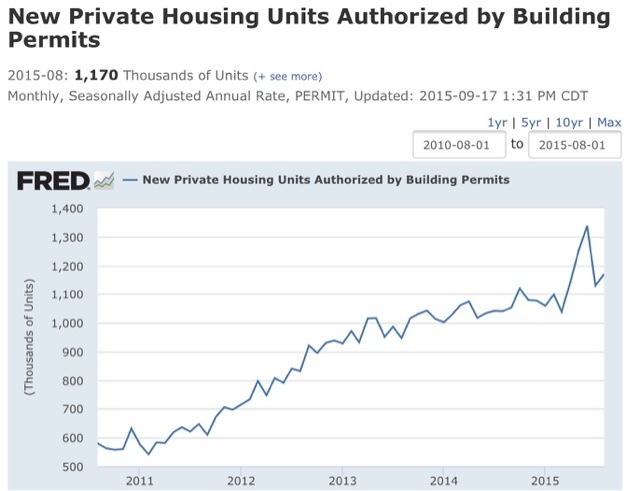 In other words, this is further evidence that there is no "housing bubble 2.0." 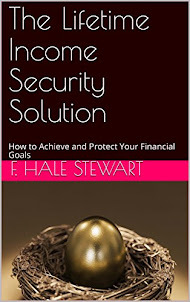 I have a new post up at XE.com, picking up on the theme of my latest "Weekly Indicators" column, and showing graphically why interest rates have taken center stage. 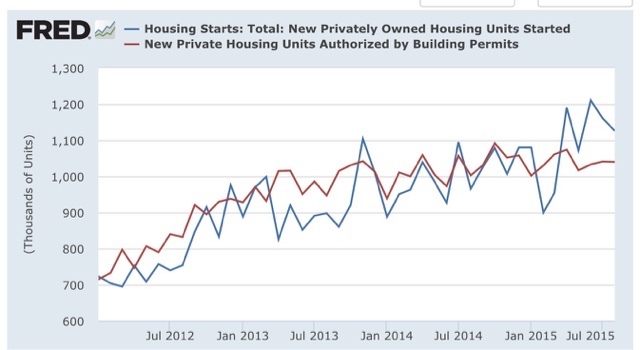 On Thursday I wrote that I had a bone to pick with the Census Bureau because of some major unexplained revisions to housing permits that made a year of growth, including a huge spike in May and June disappear. I haven't seen any correction or other note on either the Census Bureau or the FRED site, so I don't know where it originated. 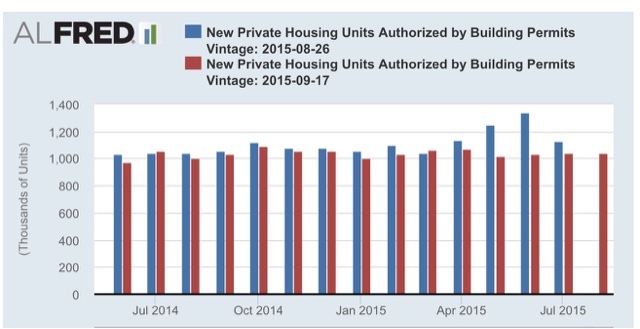 I'm gratified that the corrected information shows new highs in permits, and that August is still higher than any other month except for the May-June spike. Along with real retail sales per capita and real money supply, this is why I am increasingly confident that our economic expansion will continue through the third quarter of next year. I just wish there would be more transparency when an error like this happens.